I’d like to pass along some container gardening tips. They will help ensure your container gardening success. I have learned most of these the hard way, but also from research. In my first few years of gardening, I think I killed as many plants as I grew. Over time, I have come to understand the importance of the basics of container growing – the proper soil mix, adequate water, choosing the right containers and catching problems like pests or disease before they get out of hand. All plants need soil, nutrients and water in which to grow. They also need certain amounts of sunlight or shade, depending on the plants. Many of the same practices that are required for successful in-bed gardening also apply to gardening with containers. But, because plants in pots or boxes are limited to a small supply of soil, special consideration is needed in some areas. Soil – lighter soil mixes are needed for successful container gardening. This keeps the pot from being too heavy, but also allows for better drainage and air circulation. These two things are absolutely necessary for growing healthy plants. Whatever you do, don’t try to use garden soil from your yard to grow container plants. It is too heavy and will compact. Your water will run off the top of the soil and not get to the roots, and air won’t be able to circulate either. Really, the less soil in the mix, the better. Adequate watering may very well be the most important aspect of successful container gardening. You have to be vigilant in keeping your containers watered. And drainage is important, too. Plants that sit in too much water may suffer from root rot, and if the soil itself stays soggy, the plants can’t get oxygen from the soil. On the other hand, underwatering can cause your container gardens to wilt. Try to achieve the right balance. Mulching may be something you don’t think about doing in container gardens. However, besides making the pot look nice, mulch helps hold in moisture. There are many different materials to use. Keeping your plants healthy means fertilization. There are lots of ways to accomplish adequate feeding. I think the easiest are using a potting mix with fertilizer added or using water soluble fertilizers when you water. Again, the right balance of fertilizer is key. Too much fertilizer can burn your plants. Sunlight and shade requirements will be the same for a plant in a bed or a plant in a box or pot. The great thing about containers is that you can move them to receive more sun if needed, or shade them if they get too much. A plant’s foliage indicates the amount of light it needs. The greener the leaves of a plant, the less light the plant requires. Plants that have colored or variegated foliage need more light. Either way, the wrong light will cause the colors of the foliage to face and the leaves will be droopy or fall off. Monitor your containers regularly to make sure they are getting the right amount of light. Sun exposure may change as trees bud or lose leaves, or as nearby plants or trees grow in height. Shading from structures like sheds, nearby homes, overhanging balconies or opposite buildings will affect shade patterns. Growing plants in containers can be started from seeds, cuttings or planting mature plants. There are advantages and disadvantages to each – you can consider each method and decide what works best for you, your pocketbook and your time. Using a garden calendar is helpful too, especially if starting plants from seed. All gardeners have to fight off garden pests and disease at some point. This is true for container gardeners too and treatment is generally the same as for in-ground gardens. Visit Garden Pests and Disease for details. Successful container gardening means inspecting your gardens thoroughly and often – the easiest time to do it is when watering. Watch for browning, yellowing or wilting of leaves or flowers. Look underneath the leaves and check the stems. Watch for damage and insects. Check the soil for any buildup of fertilizer or salts on top, or to make sure the soil is not too dry or wet. Successful container gardening means having what you need when you need it! Container gardening doesn’t require big investments in terms of the supplies you will need. 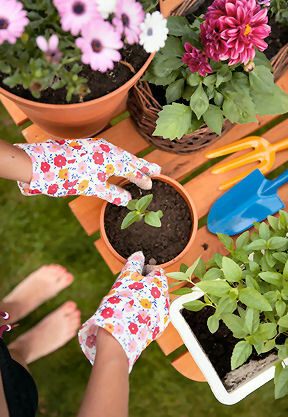 Container gardening basic supplies should include a garden trowel and a spade, gardening gloves and a watering can. I like to use a hose when I water and I have an adjustment shower wand on my hose that lets me reach up for hanging baskets and also has about 8 settings from mist to soak. I love it. Then, I keep general potting soil on hand and water soluble fertilizer. If I find that I need something specialized in terms of soil mix or fertilizer, I purchase it for the particular plant. For pruning or clipping small branches or stems, I like a bypass hand pruner and I also have a small pruning saw for larger cuts. 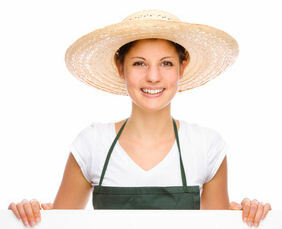 And don’t forget the sunscreen and broad-brimmed hat when you garden.